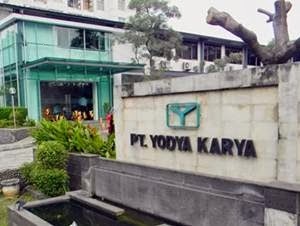 PT Yodya Karya (Persero) - Yodya Karya or commonly abbreviated as YOKA is a well-established state-owned company in Indonesia that is involved in consulting services for construction and non construction. YOKA running business in consultant planner services, including architects, engineering and management consultant services. YOKA is a non listed state-owned company and is 100% owned by the Government of Indonesia. The Company was first established in 1946 as a Dutch company named Naamloze Vennootschap Job en Sprey (NV Job & Sprey). In 1958, this Dutch company was officially nationalized by the Government of Indonesia under the name of PN Yodya Karya. The name PT Yodya Karya (Persero) officially established in 1972. Headquartered in Jakarta, YOKA now has 5 regional offices, 5 branch offices and also supported by 3 division units, namely Engineering Division, Building Division, and PLKP Division. In terms of financial performance, YOKA recorded a satisfiying financial result in 2014. YOKA registered total revenue of Rp 185.5 billion in 2014 or 10.48% growth from Rp 167.9 billion in 2013. Total profit in 2014 amounted to Rp 10.7 billion, up 27.38% from Rp 8.4 billion in 2013. This figures was quoted by JobsCDC.com from the Indonesian State-Owned Enterprises Profile 2014 issued by the Ministry of State-Owned Enterprises. Education min. S1 majoring in Law (GPA min. 3.00). Strong understanding of Contract Law. Able to control and provides an archive of legal documents. Able to identify problems and legal risks in the Company. Domicile in Jakarta and surrounding areas is preferred. Education min. S1 majoring in Psychology (GPA min. 3.00). Strong understanding of Indonesian mapower regulation. JobsCDC.com now available on android device. Download now on Google Play here. Please be aware of recruitment fraud. The entire stage of this selection process is free of charge. PT Yodya Karya (Persero) - Legal Officer, HR Officer Yodya Karya December 2016 will never ask for fees or upfront payments for any purposes during the recruitment process such as transportation and accommodation.